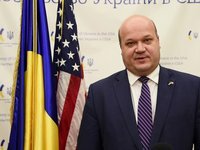 In 2019, Ukraine expects that NATO and the United States will provide assistance to it to strengthen its defense capabilities, Ambassador Extraordinary and Plenipotentiary of Ukraine to the U.S.A. Valeriy Chaly has said. "We expect further assistance [from the United States and NATO] in strengthening our defense capabilities. In addition, we expect the development of specific projects in such areas as energy and energy security," he said in an interview with the chastime program of the Voice of America published on the Facebook page of the Ukrainian embassy in the United States on January 3 morning. The Ukrainian ambassador said Russia is not only posing a threat to Ukraine but also to Europe and the United States as a whole.